MARY CAROL AND CAMERON COLEMAN bought 120 acres of primarily forested land in the Upper Peninsula of Michigan in 2005 after living in an RV for five years while volunteering for the Forest Service and National Park Service. The north end of the property borders Ottawa National Forest along a scenic river corridor. The Colemans have been working to restore the land as much as possible. With the help of grants from the Department of Agriculture, they have planted thousands of native trees. They have cut some areas of aspen in the woods to allow for different age classes, built a pond, put up bat houses and bird houses, made habitat for snowshoe hare, and built an extensive trail system. "We won't live to see much of the results of all this, but we have the satisfaction of knowing that we have tried to be stewards and to help restore the land's natural beauty." MARGARET COLEMAN earned her BFA from the University of MN in 2005 and her MFA from Pratt Institute in 2009. She is currently a PhD candidate in Philosophy and Aesthetics at Institute for Doctoral Studies in the Visual Arts, researching the conceptual structure of the Art World as an artistic medium. She collaborates on most projects and doesn't differentiate between curatorial work, artistic practice, and life. She curated for Thomas Hunter Projects at Hunter College from 2011-2012, and was Curator in Residence at Loft 594 in Bushwick in 2013-2014. She has received several grants and awards for her work including from Jerome Foundation, NES Artist Fellowship, Awesome Without Borders, Pollination Project, and Michigan Department of Economic Development. Margaret is Executive Director of Art Shape Mammoth, and a Co-Director of the Visitor Center Artist Camp, where she oversees Special Programing and Independent Projects. AMY JOY HOSTERMAN is a ceramic sculptor from Minnesota, now living and working in Colorado. She studied at the Glasgow School of Art in Scotland, and received her BFA in ceramics from the University of Minnesota. Fascinated by natural cycles and technical processes, she is a ceramics materials expert and experimental kiln-builder. She has been teaching ceramics workshops for ten years, and has received grants for her work in both Minnesota and Michigan. Amy Joy is the Creative Director for Art Shape Mammoth, and a Co-Director of the Visitor Center Artist Camp, where she has developed comprehensive clay studio facilities for VCAC's Local Clay Processing programming, creating sculpture from the local clay deposits through hand-processing, testing, formulating, and firing the clay on site using locally available tools and materials. JOSHUA HOSTERMAN earned his BFA in sculpture at Minneapolis College of Art and Design and has additionally studied social sciences and economics. He comes from a family of technical types and has been making objects by hand and machine his whole life. Joshua practices visual and community art. He has managed a non-profit teaching wood shop, worked in the preservation bindery at a large public library, hosted custom sextoy crafting workshops, opened an anarchist community center, and received several public art grants. Nowadays, he mostly enjoys drawing, photography, and helping others create objects and situations. Joshua is Operations Director for Art Shape Mammoth, Co-Director of the Visitor Center Artist Camp where he oversees Facilities and Operations, and is a Tattoo Apprentice at NoCo Studio Tattoo in Loveland, CO. He is an enthusiast of the precision of the human hand, eye, and intuition. JORDAN OLSEN is a multimedia artist working in ceramics, wood, textiles, papier-mâché, musical composition and performance, and a variety of other visual and performance media to create works that examine the composition of ourselves and the world we live in. His interests are broad-ranging and include brewing science, urban agriculture, foraging for wild edibles, material self-sufficiency, climbing tall trees and skipping rocks really far. 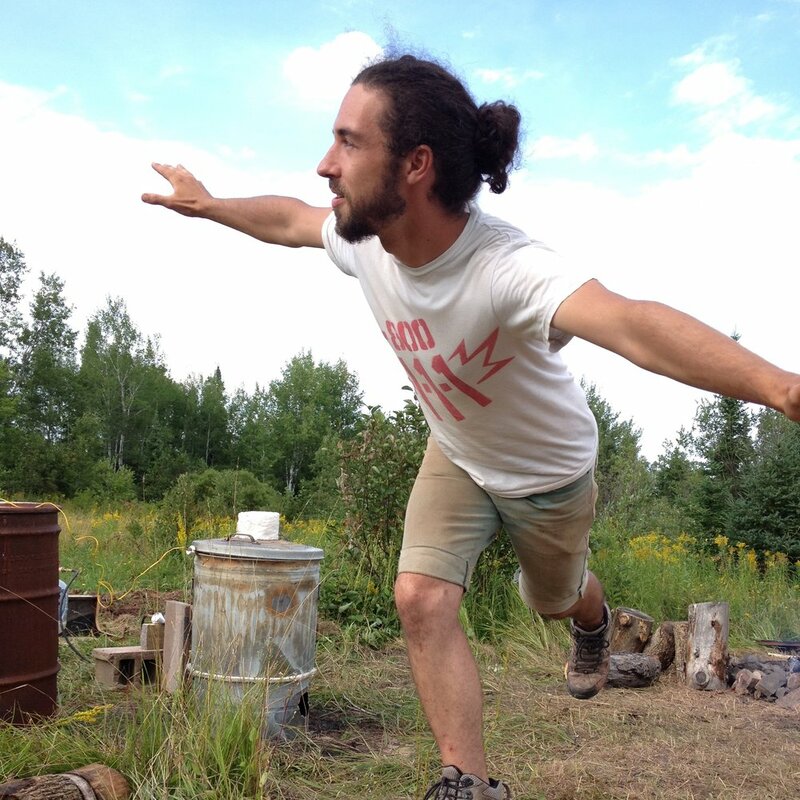 Since 2015 he has been a part of developing the Local Clay programming with Amy Joy Hosterman at the VCAC and is super excited to continue helping to expand our understanding of the rich, delicious Yooper Yum-Yum clay that is found at camp. He resides in Minneapolis, MN where he often volunteers with the Cedar Cultural Center during many of their local and international music events. He also bikes all over town all year round, and once upon a time worked downtown fixing watches for six years. He is committed to social justice, environmental stewardship, and constant curiosity in the pursuit of knowledge. MELISSA SCLAFANI grew up on Long Island (pronounced Lawn-Guyland), New York and received her BFA in sculpture from SUNY New Paltz in 2009. She grew up dancing in an Italian American family where each Sunday dinner was at 3 pm with just her immediate family - 30 some-odd-people. Her large loud family has triggered her desire to work with communities and her dancing background made her very aware of the human body and its limits. Melissa can be found teaching herself new computer programs, tap dancing in her studio and running around Brooklyn with her pup, Rufus Baby Girl. Melissa coordinates Sustainable Building Projects at camp, working alongside Mel Seeger. LINSEY MOE earned her BA in psychology from the University of Minnesota. In her day job she works in early childhood education. She finds great inspiration from these little beings and their excitement for new experiences. She believes in cultivating curiosity in children and enjoys working to create engaging environments for her students. MEL SEEGER has worked in the logging industry and run sawmills his entire life in Northern Minnesota and the UP. He builds barns, saunas, yurts and boats of his own designs; the Visitor Center's studio barn is one of his. He also makes various types of heaters, furnaces, ovens, and stoves and has been experimenting with creating insulating bricks from local clay and sawdust from his mill. He's a master of hand craft and is also tech savvy, using CAD and CNC to create utilitarian designs and visual art. He also farms and plays traditional Norwegian music with his wife. Mel collaborates with VCAC artists during our Sustainable Building projects.